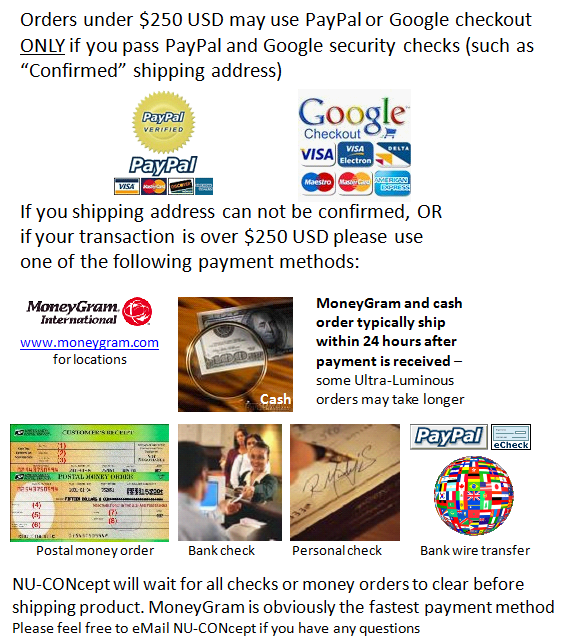 $208 USD(*) for Luminous marker and "Luminous Enhancing Sunglasses"
(*) NOTE: All of the above options include the NU-CONcept manuscript which is full of color photographs for you to mix and match ideas and a DVD with video clips to show you how easy it is to mark your cards. Your average cost is $4.50 per marked deck when you purchase one marker or $3.75 per deck if you purchase two markers. Each marker will mark 15 - 30 decks of regular cards (depending upon the size and intensity of your marks). Good for beginner, intermediate and advanced customers. Tested on Bee, Bicycle, Tally-Ho, Hoyle, Aviator & most paper based cards. Very deceptive, yet easy to read with filtered sunglasses to read marks on red backed cards. The base package does include filter for you to gimmick 30 pairs of YOUR sunglasses, NU-CONcept manuscript, video clip CD and 10 USPCC Stamp Seals (to make resealing a marked deck in it's original case easy). - Don't forget to look at the optional "Luminous Enhancing Sunglasses" for clearer & easier to read marks. (Save $20 by purchasing Luminous Enhancing Sunglasses AND marker together). Luminous Enhancing Sunglasses will always be better than gimmicking your own sunglasses because the luminous filter is built INTO the lenses vs. you having to place a luminous filter BEHIND you sunglasses lenses. To read about the Luminous Marker package AND Luminous Enhancing Sunglasses, please click here.